I took today off to tend to Edda's teeth which involved physical strength on my part and some hearty yelling on Edda's part. She needed to get a tooth removed which had died (long story) and the dentist did with with a shot of novacaine and just 20 minutes in the chair. I don't think the actual extraction bothered Edda at all, she just hated to be held down so tightly in a burrito roll. 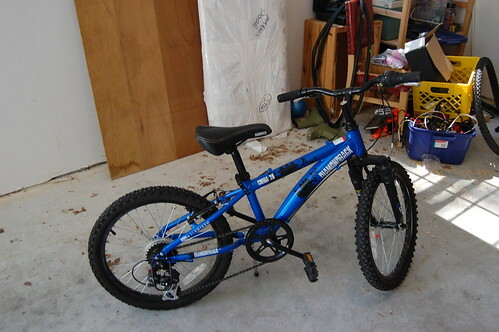 I did many other errands today which were not very interesting - however, I managed to get Vince a new 20 inch bike with hand brakes, gears and shocks for the impressive price of $25 at the Goodwill! Hooray for me :). Goodwill is a nice place to shop for something like chairs, tables, etc. Hang in there. I had to hold Joshua down several times for asthma stuff and twice he had to be strapped into a plexiglass chest so he wouldn't move during an xray. It was awful and I cried as much as he did. You have my support.